Hi, I’m Julie- thanks for stopping by, and allow me attempt to introduce myself a little. I help stuff grow, like children, plants, laundry piles and minds. I’m trying to evolve and take others with me. I live in Northern California with my rescue dog, three children who walk this earth, and one who soars. I try to live as simply, creatively and ethically as possible. I love my kids, a hot cup of coffee, finding new music, science, nature, helping others and making connections. I hike. I read. I write. Mostly about the former. I started this blog (and its ever-growing Facebook companion community) to create a place of intersection for parents of all ages and stages to find ideas and information to help them create happy, healthy, individual lives. I also wanted to create a space to talk about “taboo” things like human rights, breastfeeding and cannabis reform because these innocuous (and actually very, very beneficial) things have somehow developed a negative social standing. The existence of those social taboos are detrimental to daily living for many, many people- and many of them, parents. The only way they are going to move forward in society is if we bring it into the room, talk about it and educate ourselves and our families. As the guides for the next generation, I feel it is important to step out of that dismissive, fearful, uneducated mindset and into a more holistic, compassionate and functional one. My father died 8 short months after his diagnosis of Melanoma in 2010. 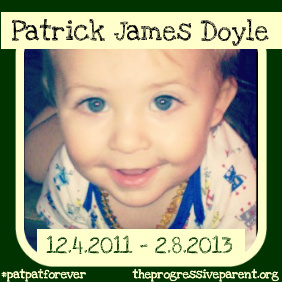 Though grief has always had a place in my writing, my entire life changed when my son Patrick (lovingly known as “PatPat”) passed away on February 8th, 2013 from SUDC (Sudden Unexplained Death in Childhood). Though I still care deeply about many issues worldwide, (like breastfeeding and birth rates and options, circumcision, marriage equality, cannabis reform, gentle parenting and plenty more) nothing is bigger in my own small world than the lack of him. My writing has become a tool to help me process his passing, and by the messages and comments I’ve read, it’s helped others heal along the way, too. Part of that is through the Sing for SUDC Challenge- find out more about how you can help other SUDC parents here. 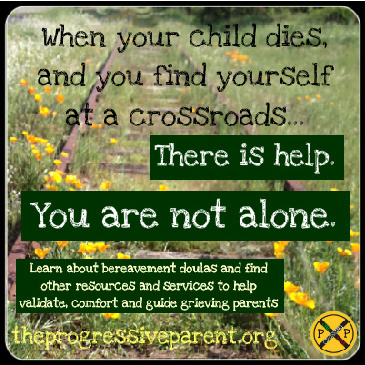 I also have a page dedicated to finding grief resources here, and an album of photos and quotes that have helped me along the way here. I a m currently trudging through the work of making my way through the processes of parenting, grief, writing and every day living as best I know how; one step at a time. One short term goal I am working on is my Bereavement Doula training, which is a very slow, deep, healing, but painful and (triggering) process. I hope that by taking the time I need with myself and my studies and trying to stay honest, I can become an instrument to help the 1 out of every 4 women who was experienced miscarriage, stillbirth, infant or child loss. It is the worst road a parent can be forced to travel, but 25% of us are doing it- and most of them without validation, comfort or support. I am to change that. How a make a living adds up much the same way as the processing of my grief or anything else- little by little. I am grateful to have a small handful of readers who donate a small monthly amount (even $1!) that add up to an amount that helps me squeak by every month. If you’d like to pitch in your cup-of-coffee’s worth, all you have to do is click on the donate button below to make a one-time -or- recurring donation. You can also check out my (extremely expansive, ever growing and longstanding) amazon wish list below… there’s everything from bubble bath to a beach cruiser on there- anything that has been purchased is automatically removed, so no worries about buying something that’s already been sent. You know, in case you were worried about my apartment getting flooded with beach cruisers or something. It would create a space issue, but I digress. The good folks below are the ones that help put food on my table and enable me to continue to do the work I have ahead of me, both in writing and in life. If you are interested advertising as a sponsor, please contact me via email or using the form at the bottom of the page. You can get a feel for the way and the what of my writing here, read about way I process grief here, about Patrick’s passing here, or from the beginning starting here. Thanks for your time, and I look forward to hearing from you.